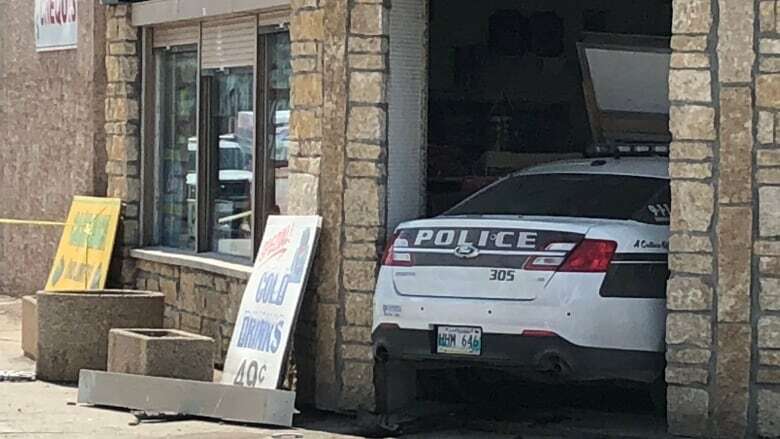 Two Winnipeg officers were not responsible for a crash that sent a 73-year-old woman to hospital with a collapsed lung, fractured right ankle and several fractured ribs, says the province's police watchdog. 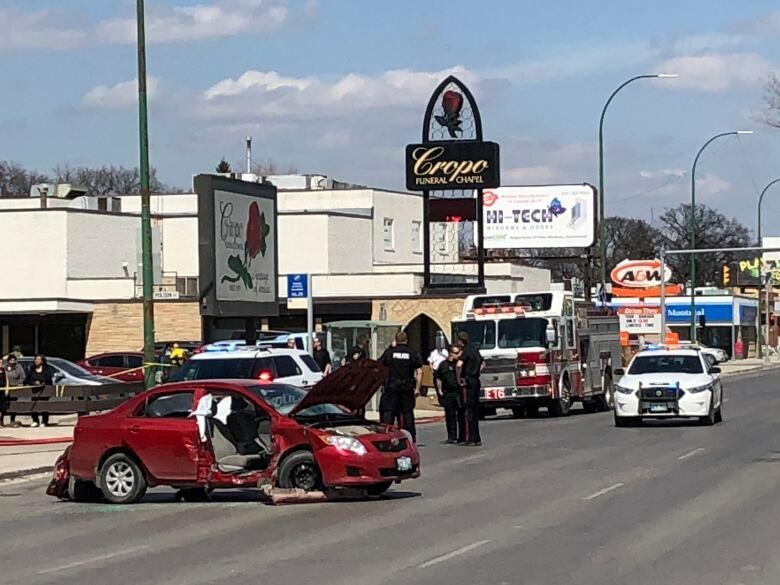 The Independent Investigation Unit of Manitoba released its decision on Wednesday into its examination of the crash at Main Street and Polson Avenue last April. The investigation found neither the driver of the police vehicle nor his partner responsible for the crash. The driver of the other vehicle involved, a Toyota Corolla, is solely liable, investigators said. On April 21, three marked cruisers with sirens and emergency lights going responded to an urgent call about a man armed with a knife and threatening another officer. The Corolla, waiting to turn left from Main onto Polson, waited for the first cruiser to pass but turned into the path of the second one, the IIU said. The crash sent the cruiser into the front of Bargains Galore on the southwest corner of the intersection. Only the very back of the police car was sticking out of the entrance when it came to a stop. Both vehicles and the business sustained extensive damage, the IIU said. The driver of the Corolla was not hurt but the 73-year-old passenger was sent to hospital in unstable condition and the two officers from the cruiser were sent to hospital in stable condition. 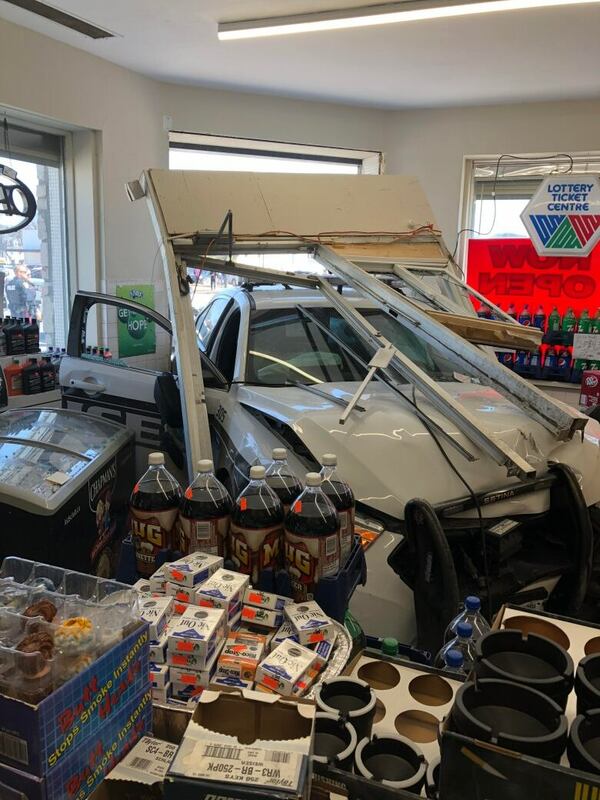 As well, four employees and one customer inside the store walked away unscathed. The IIU was mandated to investigate because the elderly woman's injuries required hospitalization. Investigators reviewed police radio communications, video footage from nearby buildings, traffic camera footage and recorded crash data from the involved vehicles. They also interviewed 10 witnesses.